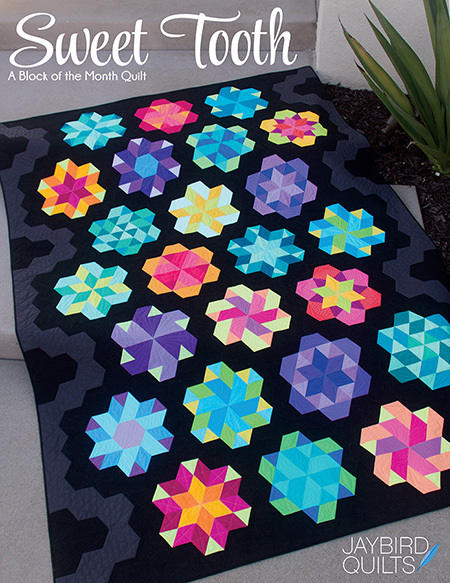 Want to make this quilt? Well you are in luck today!! 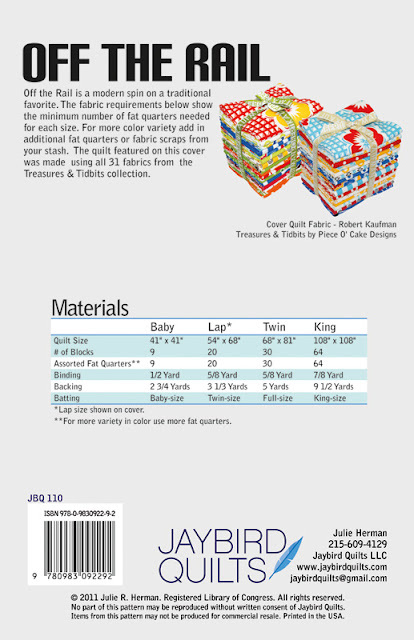 Treasures & Tidbits isn't available until July... but you can win some of it right now thanks to Robert Kaufman Fabrics! 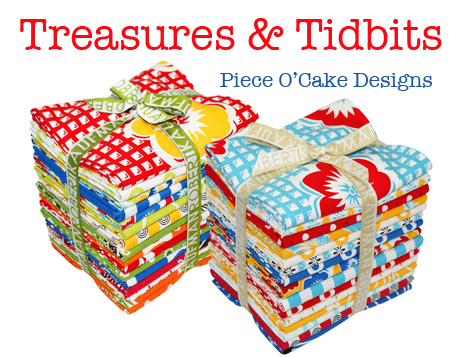 T&T is the next collection by Piece O' Cake Designs. Robert Kaufman is offering one of you both yummy bundles below! The Leaf colorstory has 16 fat quarters and the Marigold colorstory has 15 fat quarters. That's almost 8 yards of fabric!! To complete the package I'm going to include a copy of my new pattern Off the Rail for you! This design was in my sketchbook for a while... and as soon as I saw Treasures & Tidbits I knew it was the perfect fabric for this design! 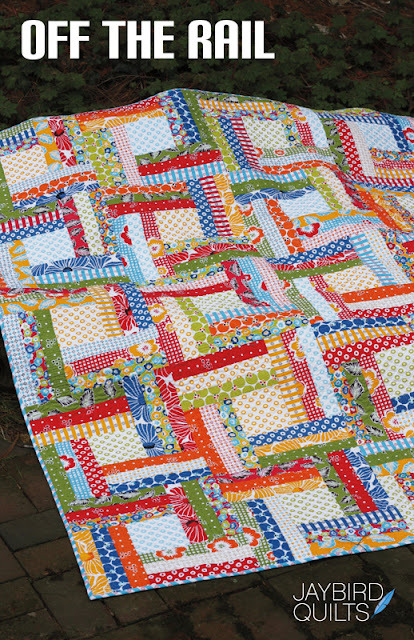 With both fat quarter bundles you can make the baby, lap or even the twin size! Here are the swatches from this beautiful collection. leave a comment for each entry. pretty simple. leave a comment & tell me which color or print from this collection is your favorite. You have till midnight EST on Thursday the 21th to enter! Giveaway Now ClosedWinner announced soon. Of course, I love the reds in this collection, but it is all great! I posted a link on facebook! You know what I love about this fabric and pattern? It's FUN! I'm not a big fan of serious fabrics, because I'm not a serious person! I try to let my personality come out in my quilts, and this is awesome! I like the Leaf colorstory, but both are awesome. Loving them all -- but am drawn to the polka-dotty ones. Also like the blue / red florals. what a lovely giveaway. These colors all work together. . especially highlighted with your pattern. If i were to buy just one fabric it would be the blue with red flowers.. . just my style these days. I like the green with the orange flowers on it. Ooooh....if I have to choose a favourite, then it's floating feather in 'leaf'. I just tweeted about your giveaway. I love your quilt pattern done in the fabrics! I think that i like the reds and brilliant oranges with the flowers the best! I am super duper in love with this fabric! My favorite would have to be the green polka dots!! What lovely fabric! And your pattern is perfect for it! 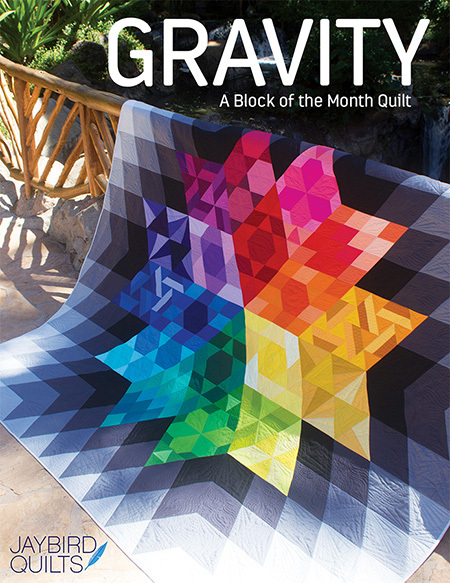 Hope I win...I'll be making some beautiful quilts! I really like the big flower print in blue! I love them all but must say the big gold flowers are my favorite!!! I l ike the bright green with white dots and flowers. I posted the linky on Facebook to let everyone know about the great giveaway! I like the aqua with red flowers. They are all so cute though! I posted a link to fb. I love the little red flowers on the blue background - what a happy color combination! Just posted on my Facebook page! I like the red blocks but im a red fan. :) They are all great. I really like the quilt pattern . The RK website doesn't list names for the prints, only serial numbers. 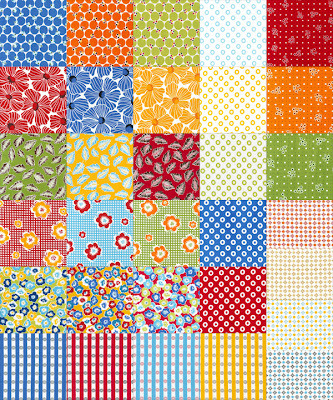 With that in mind, I think my favorite print are the strips with dots between-- particularly in the primrose colorway. This entire collection is adorable, really. if I don't win, I might just have to buy FQ bundles myself. My favorite colors are the oranges and my favorite print is the green background with orange flowers. I love the green dots, beautiful! and the blue with red flowers is really fun. 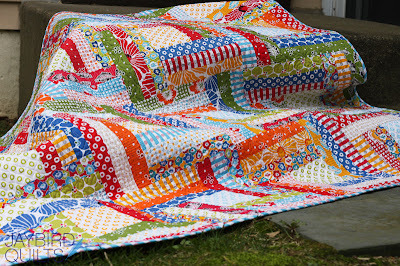 beautiful fabric and a lovely quilt! Oh my Goodness I love this pattern and the fabric soooo much!!! I really love the orange dotted fabric is it little oranges?? mmm they're all cute~! thank you for the giveaway very awesome! This is a hard choice. I like them both. I guess I would have to go with the Leaf one. and I tweeted the giveaway, thanks again!! I would love to win this! I have never made a quilt but sew ALL the time and would love to try. I love the orange from this line! What a beautiful giveaway. Thank you! All the colors and patterns are so cheerful! I think the big flowers on the dots are my favorite. I love the large blue flower on white background. The red and yellow ones are great also. The whole line is beautiful and I love it done up using your pattern! I have tweeted out the giveaway!! AM especially partial to orange and green right now and LOVE the smaller floral white on color. BUT it is all georgouse. Thanks so much for the oppurtunity !!! I love the big floppy flowers...in all colors. Great stash builder print that isn't a basic stripe or dot. I love the whole line, but especially the little multi colored florals! Thanks for the chance to win! I love these prints, so cheerful, and your pattern is just gorgeous! I like the larger flowers on the white background. Actually, I do like them all, but that one gets my attention first of all! Love your pattern! I love the color combo of the green, blue, and yellow flowers. I love the red flowers! What a happy collection. My favorite is the blue flower print, second from the left in the second row. Thank you for the opportunity to win pretty fabric and an awesome pattern! I love the two shades of blue...but the red is great too! i like the gingham with daisies. love the quilt! I love the blue colorway!! My fav would be the print with the big blue flower!! I like the green with orange flowers! Oh put my name down, I love this fabric, have just make a picnic quilt using the charm squares I won from you..... could I be lucky again - I sure hope so. The yellows are my favourite. I like the gingham with daisies too. Hoot Hoot I shared the link about the giveaway to my facebook page!!! I love the bright blue big flower pattern! Also the same of the yellow! Super cheerful and they scream summer! I like the green honeycomb looking one. tweet tweet! My first time using @ on twitter! I'm still a newbie! Thanks for giving me the inspiration to try it out! The red dot is fabulous. That shade of red is so saturated and cool (color wise lol). It's hard to find a great red. I like the big blue flower....very bold ! I love all of the red prints, but especially the aqua with big red flowers. The whole collection is just so fun! I posted the giveaway on Facebook. I would love to win! It's hard to choose, but I love the blue floral. The vibrant colors in those bundles are so beautiful! I love this fabric, both colourways! I'm REALLY loving the marigold colorstory. Gah, and that vivid orange is just HOT! What gorgeous fabrics - and what a generous giveaway! Love the aqua with the red! I like the fabric with the green background and orange flowers! I like the white with blue flowers. THe blue! To be specific the blue dots, I have two boys so blue is in our home. THis would make a perfect picnic quilt! It's all awesome! I'm especially drawn to the red prints. Thats an easy one...I like the red with the little circles on it. I love the dots! So many fun things to do with those. I love the turquoise blue scattered with the red flowers - too much fun! Which print is my favorite?! I love them ALL! If I had to pick just one though I'd probably go with the red flowers (first print in the second row). I love all the dots, but especially the red and white. I love the oranges. Thanks for the chance! I love the turquoise with the big red flowers. It's one of my favorite color combos! Is it okay if I like pretty much all of them equally? Anything with dots, though...that really makes me smile and those bright colors...who could ask for better? Such a great package that I could turn into a wonderful baby quilt for one of the 4 pregnant friends! Thanks for a chance to win. Thanks for the chance. I love that orange is included!! I'm loving that bright blue! Thanks for the fun giveaway! The blue/white gingham with the big red flowers! I mostly love the reds, especially the big red flower on the white background. I really like those pindots on the edge there. ALL the colors are just so bright and cheerful. Thx so much for the chance to win, and for adding your pattern. the oranges are delicious! beautiful fabric, thanks for the opportunity to win! What a great quilt - good use of the fabric line! I am drawn to smaller scale prints - I like the gridded small dots! The little blue, aqua and yellow floral is talking to me! I posted a link to this on my blog. I posted on FB about it! 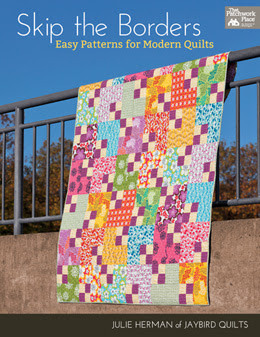 this pattern has been in my wishlist at FQS! also tweeted about this fab chance to win! I am still in my blue and red phase, so I love the blue and white gingham with the birght red flower. Thank you and Kaufman for the great giveaway. I love the blues and greens with flowers. I posted the give-away on my FaceBook page. I love the Marigold collection and always the reds, lovely giveaway! I love the Marigold collection. I have decided i want a picnic quilt. I looked at this pattern just this morning and this fabric would be perfect!!! LOVE the reds in this collection... so cheerful! It has a great picnic feel! I love the light blue with the little red flowers the best! Love the green! Can't wait to get my hands on some of this. I love the vintage feel of this group! Especially the gingham checks! And your pattern is wonderful. Thanks! I like the blue color quite a bit. But, my favorite print is the red gingham with the orange flowers. Love the blue and red print! I'm really excited about this range, you can keep you DS at JAF, I'm in line for this one :) I'm loving how the whole works together, but if you made me choose, it would be Marigold. My word verification is "priza" do you think that's an omen!!! I just love the marigold fabric. 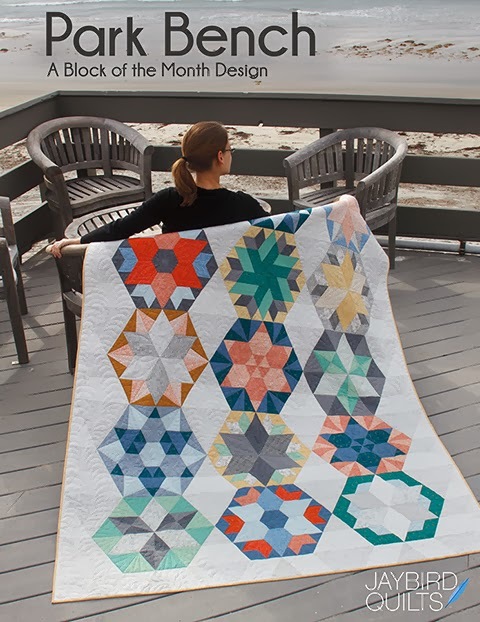 It makes a great backing for your beautiful quilt! I like the prints with the dots that look like O's. I think this fabric and your pattern would make a great charity quilt for a child or 2! Love this pattern...and the fabric! My favorite is probably the red gingham...but love all the designs! hmmm, pick a favorite print? Well, I'm always drawn to oranges, so it's between two of those... maybe the large floral. But they're all just too cute! I love the flower prints. Adorable! Loving the turquoise with the red flowers & the blue 'cheerio' dots. Great colors. I can't pick a favorite, they all play so nicely with each other. I bet they would play with american jane too! I've blogged about your giveaway here: northstarquilting.blogspot.com. Do I get an extra entry because the fabric matches my colour scheme? I love them all together, but if I have to pick a favorite it would be the red flowers almost covering the white background. My favorite is the blue and green small floral print! Posted this to my Facebook profile, too!! What fun! I love all things Piece O'Cake but if I have to choose, would pick the leaf. And you're right. It is perfect with that pattern! I favor the leaf color story best. But I like anything retro. I love them all, but since I have to choose - I really like the yellow gold flowers (3rd from left, 2nd row on your samples). Thanks for the chance at winning. I like the leaf color story the best - but my favorite individual patterns are the big flowers in red and blue. They're so much fun! I shared this on facebook. Thank you for giving us the opportunity to win and being such an inspriation. The blues :D Although I love the set as a whole, very very much. A other give a way . Bea langeweg from Canada Alberta . What beautiful fabrics! I love them all - but I think the big blue flower is the one that jumped out at me the most!!! I love the oranges, and looks like another source for a true red. Not sure of the names, but the first three in the second row are very nice. Oh I want this fabric and your pattern so bad! I'm on the FQS wait list for it. Either bundle is ok bit the plaid would work for your quilt. Thank you. I mentioned this on facebook :) Pick me! The fabrics are so pretty. Thanks for a chance to win. I love all the orange prints. Can't get enough orange. I just love the blue with the red flowers! I love all the prints but green is my favorite. I made a comment on my Facebook page which is mostly quilt shops. it Judith Blinkenberg. My birthday is May 4 th. what a nice present it would be. Ohhh...the green prints are my favourite! This is an awesome giveaway! I like the blues. What at great collection. Be back after I post on my blog. I just love the light blue stiped pattern with the little red swirls! I don't know why but I am in love with those colors together right not! I love the rest of the fabrics too!! I tweeted about your great giveaway!! Ohhh....the oranges are calling to me! Beautiful fabrics and great pattern to showcase them! Thanks for the opportunity! I LOVE the red/blue/yellow floral prints. 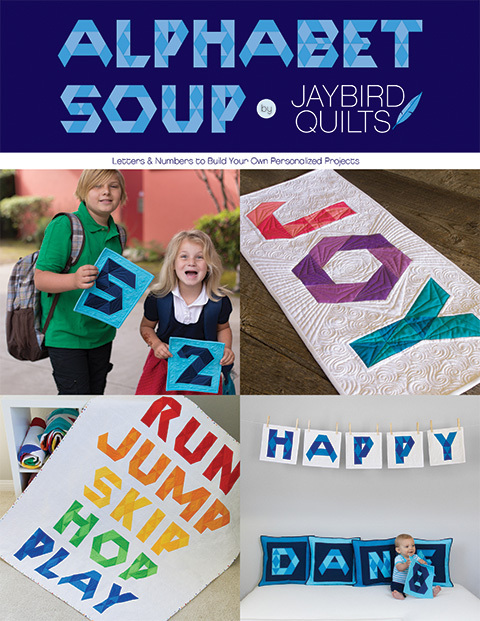 And this collection along with your pattern would make super cute toddler quilts for my B/G twins! This is the mother of all giveaways, I think. 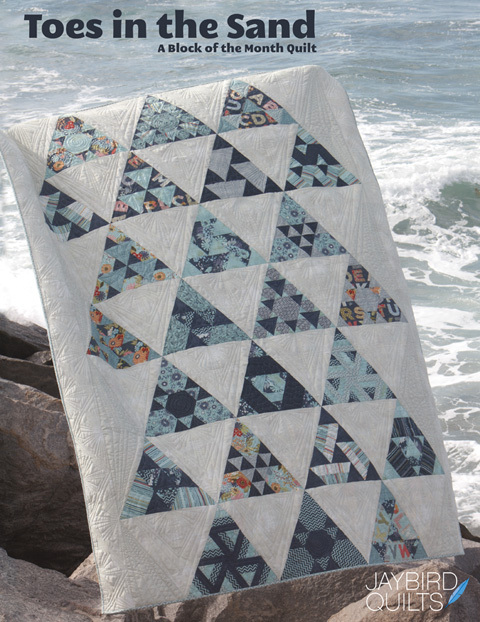 I really like the Off the Rails quilt in this fabric. Bright colors are my favorite. If I had to pick one fabric from this collection, it would be the orange dots. I am partial to greens, so I like the green prints the best! Great fabric for this pattern! I'm partial to the orange small flowers on the dot background. Thanks for the chance to win! I like the green with tiny dots. Thanks for the great giveaway! Beautiful fabric and wonderful pattern to use it with. My daughter wants to do charity quilts, so hoping she is serious enough to help me out and we can do some for the children's hospital. Posted a link on FB! Thanks Julie for this incredible opportunity!! The reds in this collection are awesome, especially the way they play with the blues and the yellows!! So pretty!! Oh I love the 3 patterns with flowers on the checks. The blues really do it for me! I like the bright yellows, and I love the red and yellows together, looks awesome. My favorite colorway is that awesome tangerine!!! SO GORGEOUS! Thank you for hosting a great giveaway! I love the turquoise and red flower, so pretty! Oh, it is so difficult to pick a favorite in this lovely selection. I like the big red flowers. I'm lovin' the bright blue flower on the white background. Thanks for a chance to win! I'm usually a blue and green girl but it's been so gloomy here lately I'm really feeling the sunny yellows and oranges. I like the red one with the small dots... too cute!! I really like the large blue floral. Thanks for the chance! Ooo...so hard to choose from. I like them all! But if I had to choose just one, it's the blue with big red flowers. So pretty! Are you kidding me? this is an AMAZING giveaway! I really like the big yellow flower print on the second row of swatches. Love the blue check with red flowers! Now I'm craving watermelon... this cheery fabric makes me think of picnics and family and sunshine in the park! I love the variety in this line but those big, blue flowers have caught my fancy the most! Thanks for the chance to win this awesome giveaway! I just shared the link on my FB page!!!! Any of the oranges :) Can't get enough orange, and of course with orange there has to be blue! I am colle3cting red right now, so that's my favorite. They are so perky! Facebooked it for ya! Such a lovely stack of fabrics that will look great in your pattern! How beautiful! I love the honeycomb designs best. Reminds me of summer! Would love a quilt like this on our bed for the warm months! I posted on twitter already (@nichole2203). Thanks for sharing some inspiration! All of the colors are wonderful, do love the orange though. The red with the dot of course is my favorite!!!! Both color stories are great in this collection. I am really loving the way the reds pop. I think all the designs are great but I am always a fan of polka dots. Thanks for the opportunity to win the fabrics and your pattern. I like the hibiscus-like flowers. I facebooked about your contest......can I win? can I win???? Love the leaf colors. Thank you for the giveaway. Super fabulous giveaway! Thanks for sharing!